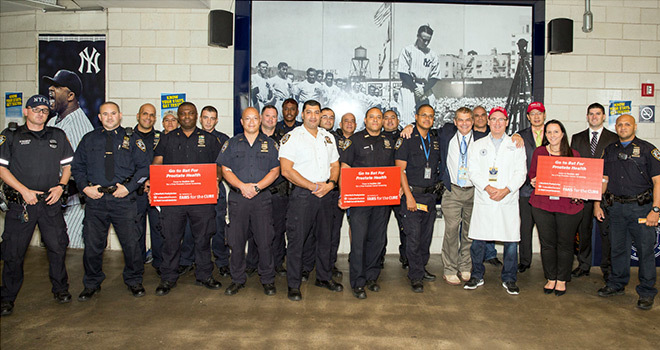 Working closely with our partners, the New York Yankees and NewYork–Presbyterian Hospital, Fans for the Cure hosted a PSA Screening for men at Yankee Stadium for the second year in a row. This important awareness-raising and cancer screening event was a notable success: In the two years that we’ve been hosting it, 221 men were screened via a PSA test. Of those 221, 41 men underwent a DRE*. This is why we exist. To share reliable and detailed information about prostate cancer with men from all walks of life. We are committed to encouraging and supporting men to monitor their health. It’s a big part of who we are and what we do. I’m so grateful to the Yankees and Dr. McKiernan and his team for their continued, dedicated support and leadership in this important area of men’s health. As a charity focused on prostate cancer health awareness, we were delighted to take our educational materials to such a venue at the Yankees Stadium. There were able meet with a diverse cross-section of the communities we serve. The PSA screenings and digital rectal exams (DRE) were conducted by the Urology Department of NewYork-Presbyterian, under the direction of Dr. James McKiernan, who sits on our charity’s Medical Advisory Board. We are grateful for the continued leadership that Dr. McKiernan and his colleagues bring to our efforts.